Firefox are working on a Honeycomb version of their, lets say, not quite so popular phone app. Luckily for us the Honeycomb app actually looks quite nice. They have done a great job on the UI, but at the end of the day the performance will be the key. This is one area where their phone app lets them down, so hopefully they have learnt from this. 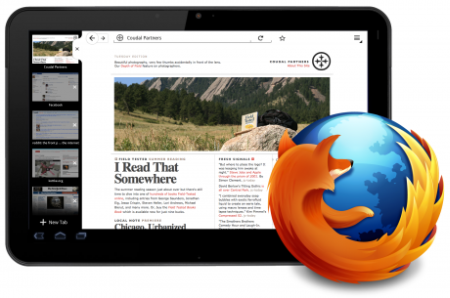 Firefox looks right at home on Android 3.0, drawing its overall theme from Honeycombâ€™s minimalist design language. Of course, this is still Firefox, so weâ€™ve made sure to keep familiar visual elements in place, like our signature big back button and a distinctive tab shape. Our Awesomebar uses the same tabbed menu to allow quick access to bookmarks, history, and your synced desktop activity. Users of the current phone version of Firefox will notice that the tabs have been moved off to the left, which makes them easier to reach and increases the number of results that can be displayed above the keyboard. On Firefox for phones, we meticulously tucked away all of our UI elements to free up the screen for unrestricted browsing. On a tablet, the bigger screen let us to bring some of those helpful elements back onto the screen, like tabs, for example. In landscape mode, tabs exist in a persistent left bar, allowing for quicker browsing. You can switch through tabs with your left thumb, and scroll through web content with your right. In portrait mode, this tab bar gets rolled up into a menu item at the top of the screen, to free up browsing space below.